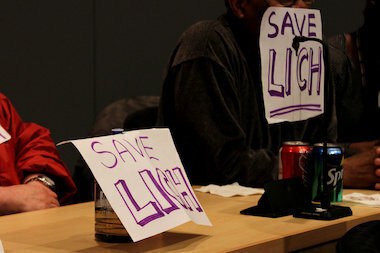 A judge gave LICH bidders until May 21 to come up with a plan to keep the hospital afloat when SUNY no longer continues operations that week. COBBLE HILL — A Supreme Court judge ordered three bidders interested in taking over Long Island College Hospital to find a way to maintain its medical services — a move that left the courtroom confused over the Cobble Hill hospital’s fate. With only a week left before the State University of New York, LICH’s current owner, stops operating the hospital, Judge Johnny Lee Baynes ordered the top contenders the Peebles Corporation, Fortis Property Group and Prime Healthcare Foundation to meet Thursday afternoon and find a way to preserve some healthcare services before the hospital closes on May 22. SUNY has already begun implementing its own closure plan by diverting ambulance service as of Thursday morning. Baynes ordered SUNY to cease from carrying out further reduction in medical services. The judge added that he hoped to see someone willing to take over operations at the facility on May 23 or sooner. He added that perhaps all the groups could work together on a joint deal. However those familiar with the past negotiations said there has been an unwillingness to make a plan that involves power-sharing between organizations. In addition, the former ombudsman of LICH said it's unlikely that the top three bidders will be willing to team up to save the hospital. “Working together has not been the style,” said former LICH ombudsman Dr. Jon Berall, who called the decision “remarkable." “We’re all confused,” he added. SUNY began contract negotiations with the Peebles Corporation last week after pulling out of a deal with Brooklyn Health Partners, the team first tapped to run a full hospital at LICH. The state will be allowed to continue separate talks with Peebles while also speaking with the other two groups, Baynes said. But community groups and Berall have expressed concerns that with time running out, Peebles doesn't represent the best qualified group to take over LICH. The groups have questioned the process of ranking each bidder's proposal, saying they believe the state “inaccurately calculated” the scores, according to attorney Jim Walden. Walden asked the judge to throw out some scores that the community had deemed questionable — a move that would bump Peebles from second place and instead boost Prime Healthcare Foundation, which has proposed to run a nonprofit hospital, into second place instead. Fortis Property Group, which is partnering with NYU Langone Medical Center and Lutheran HealthCare, told the judge Thursday that they were ready and willing to open an urgent care facility for the site on May 23 and also proposed a 24-hour freestanding emergency department, cancer center and residential units in its plan, according to its proposal and attorney. Representatives from the Peebles Corporation were not present in the courtroom. Any team that plans to run LICH still requires a license of the state Department of Health. An attorney for the DOH said no operator has applied for a license as yet. The groups will meet back in court on May 21.